See where supermarkets have their regional strongholds. Tesco is extending its retail supremacy at a local level, research suggests, becoming pre-eminent in a growing number of areas across the UK. It is now the number one supermarket in 68% of UK postcode areas, according to a survey by analysts CACI. It estimates that Tesco stores now account for 50% of total supermarket sales in six areas, including Inverness in Scotland and Truro in Cornwall. Tesco says the UK supermarket sector remains highly competitive. While Tesco has a 31% share of UK supermarket sales, its chief executive Sir Terry Leahy maintains that 90% of British consumers have access to three different supermarkets. CACI's annual survey of "supermarket dominance" found Tesco is now ahead of its rivals in 81 of 121 UK postcode areas, up from 68 last year. Each catchment area comprises 200,000 households on average and represents an aggregation of individual postcode sectors within individual towns, cities and London regions. CACI bases its findings on official sales data from supermarkets in different parts of the country, and qualitative judgments about how store size, accessibility and brand loyalty is likely to influence customers. Over the past year, Tesco became market leader in a further 13 areas, including Croydon and Kingston-upon-Thames. Tesco has also moved into second position in a growing number of areas, pushing Asda into third place in its home city of Leeds. However, the figures show that Tesco is by no means dominant in all parts of the UK. 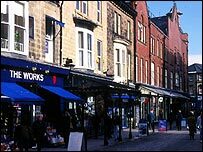 It has no stores in prosperous Harrogate - where its main rivals have 75 stores between them - and is trailing a long way behind the competition in Newcastle, Wolverhampton and Sunderland. One of the report's authors said its findings showed how alert Tesco was to changing trends and its customers' needs. "A lot of people complain about the march of Tesco but consumers vote with their feet," said Nicki Christie, an associate director at CACI. "What this shows is that Tesco is serving its customers well and providing them with what they want." Asda and Sainsbury's also hold powerful positions in key cities and towns, the report points out. Asda stores are estimated to account for a third of all supermarket sales in Glasgow, Bolton and Liverpool, while Sainsbury's is in the same position in south-west London, Swindon and Guildford.